Make cookies as directed on pouch; cool completely. In small microwavable bowl, microwave white baking chips uncovered on Medium (50%) 60 to 90 seconds, stirring every 30 seconds, until chips can be stirred smooth. Take half of the cookies, and carefully dip each cookie halfway into melted chips; wipe off excess. Place on cooking parchment paper-lined tray; sprinkle with desired candies. 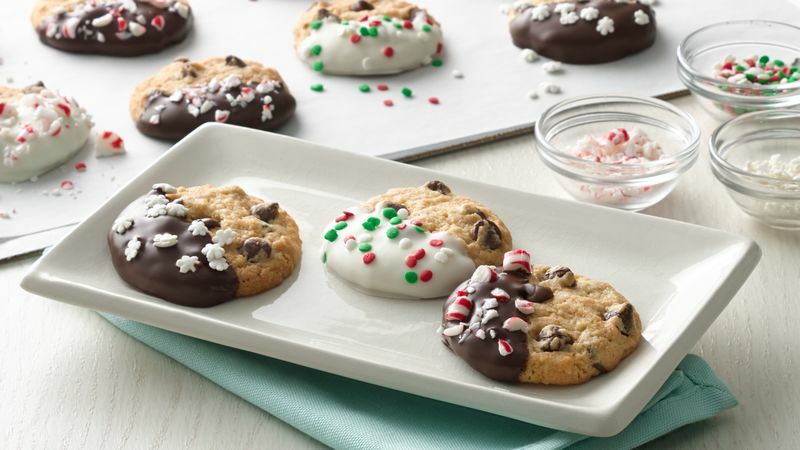 Repeat melting and dipping steps with semi-sweet or Special Dark™ chocolate chips and remaining cookies. Let stand until coating is firm, 1 to 2 hours. If desired, spoon melted chips into small resealable food-storage plastic bag. Cut off tiny corner from 1 end of bag, and squeeze to drizzle onto cookies. Sprinkle with desired candies; shake off excess. Make 'em extra-fancy! Use pull-and-peel licorice, sliced gumdrops or other candies to add holiday sparkle.